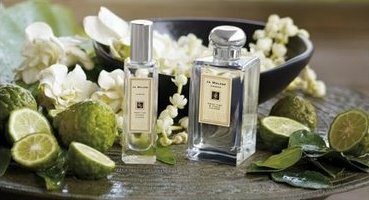 Jo Malone's new Sweet Lime & Cedar cologne was reportedly inspired by Thai food — the notes include sweet lime, jasmine, ylang ylang, coconut, tonka bean, pandanus leaf, tamarind, cardamom and cedar — and that's fine with me: I love Thai food. The opening is strong citrus with lots of greenery, and for a few seconds, it reminded me very much of Jo Malone's Lime Basil & Mandarin, a popular scent that I understand is one of their bestsellers, but which I find unforgivably brash (apologies to its fans). Happily, Sweet Lime & Cedar softens rapidly, and then it's just right: a mild, summer-y blend of citrus and woods. It isn't a spice-fest and I don't think I would have thought of Thai food on my own: the coconut is hardly noticeable, and the overall character isn't really foody anyway. Still, the pandanus leaf (not a note I am familiar with, but it's said to have nutty and hay-like accents, and both are present here) and tamarind add slightly exotic elements. Sweet Lime & Cedar is not, perhaps, so interesting as the recent Kohdo Wood duo, but it's nicely done, and not counting the Kohdo Woods, I like it better than anything else Jo Malone has done in recent memory. It is heavy on the cedar, so some women might perhaps find it a bit masculine for their taste, but I'd call it a unisex and I believe that is how Jo Malone is marketing it. I did not have time to try any layering combinations other than Sweet Lime & Cedar + Vintage Gardenia (I'm always trying to layer that darned Vintage Gardenia); that was surprisingly successful. The pairing brings Vintage Gardenia's sweetness down to acceptable levels and amps up the spicy notes from both scents. Nice. Jo Malone Sweet Lime & Cedar is available in 30 and 100 ml Cologne. Update: I forgot to mention another "inspired by Thailand" citrus fragrance, Cinq Mondes' Rituel du Siam. That one is spicier, and the citrus notes are longer lasting, although as is often the case, that means the citrus starts to feel brash after a time. Still, very much worth a try. This is elegant layered with Pom Noir, or clean/fresh layered Orange Blossom or White Jasmine/mint. Must try! I love lime as a flavor but have yet to find a good expression of it in scent. Interested to hear your comparison of it to Lime, Basil, Mandarin, which is totally horrible on me – the basil smells like those old jars of herbs you find in an elderly relative's pantry when doing a house clearance after their death. (And I speak from experience here!) I don't think the cedar would bother me unduly, as long as it is not as “trapped in a tea chesty” as Tam Dao say. I am most excited about its layering potential with Vintage Gardenia, which is one of the albatrosses of my FB spending splurge this year on account of its extreme sweetness. I think it worked best with Orange Blossom from memory, with which I was able to create a poor man's EL PC Tuberose Gardenia, but I would love to cut through it with something more astringent ideally, and this could be just the job. On my hit list for October in London! Thanks, you explored more than I did! I can “picture” it with Pom Noir. They are comparable for only mere seconds, though…was scared, but needn't have been. And HA, VG is one of my albatrosses too. I really liked it the day I bought it, every single time I've worn it since then I'm shocked that I bought something so sweet. Rivercat, this is not likely to end up being anyone's “holy grail lime” though…simply because it isn't focuses so very much on the lime. The lime note is nicely done after it calms, just that I wouldn't think of it as a lime scent, primarily. I had quite an afternoon of spritzing JM's frags with a girlfriend recently. It was quite fun, my friend (a budding perfumista) hadn't heard of JM, it was great seeing her reactions to the scents and combinations. I think I remember you saying so in a subsequent review to the first one you did of it, where for a brief moment it was your favourite of the line. I don't know what got into me either in the shop. I got Nectarine Blossom & Honey at the same time, and am furiously trying to layer that one as well, haha! Happily, there's been no backpedalling on the Kohdo Woods Duo, which I think are ground breaking, as JM goes, especially Night. That's too bad this isn't a primarily lime scent, but I'll still have to check it out. I'd love to find a really nice lime. I tried this on last Saturday, expecting not much–I'm afraid of Cedar, it makes me smell like a lumberjack with bad breath. But ahhhh, this was wonderful. I got great lime and some spices out of it, almost no cedar. So then I used the Amber and Lavender lotion and sprayed it on that arm. Heaven! The AL, which is a bit masculine, gets rounder and the SL lets out more spice. A wonderful mix, for sure! You really have a knack for hitting my lemming buttons sometimes. I need to smell this (still haven't made it to Saks), and I'm hoping that it's VERY cedar-y. Lime Basil Mandarin and Grapefruit are fave JM scents of mine and I consider them to have decent lasting power. How would you rate longevity of this one? In any case, I can strongly predict I'm going to end up with a 30ml bottle after October 1…. R: How did you feel about the CdG Series 8 Lime? I still haven't sampled that one. Also curious about the “Kaffir” scent from Anya's Garden — a bit pricey for me, but something other lime-seekers may wish to look at (Kevin reviewed it here awhile back; check the archives). I heard the CdG Lime was more generic citrusy smelling rather than lime. I recently tried Anya's Garden Kaffir Lime and it was a bit dry/dusty rather than fresh lime. Sounds like fun! Did you try this one? We're in the same boat — the Kohdo Wood was a much wiser purchase. for those who are looking for a good lime, you might want to check out Floris Summer Limes. It stays refreshing and sweet for a surprising duration. I've been wearing it for a couple of summers now. Scored it for a bargain at TJ Maxx. as for SL&C, I thought it was pretty nice, but not amazingly special. It had a nice bright opening, then quickly dried down to a subtle soft clean note which lasted a long time. Not much cedar on me, and it actually seemed more on the feminine side, to me. Hi Robin, thanks for your review .. in fact, for all your reviews .. wearing Lalique's Encre Noir atm thanks to you I have one little question though, was wondering if you could consider it: you review male, female and unisex fragrances, and for me as a man I'm mostly interested in male fragrances. Some sites have something like an icon indicating the intended audience in the title .. would that be an idea here? For some reviews I have had quite some trouble to figure out whether it's for men or not .. Anyway, thanks for this site, I'm pretty new to fragrances and finding a lot of useful information here! Well I remember you very much liking L'A The Pour en Ete, which is a cedary citrus. So I think you'll probably be alright. I haven't had a chance to try that one yet–asked for a sample in my last luckyscent order but got others instead. I've never tried the original Floris Limes, sad to say! This is just a wild guess, but I'd expect the original to be more masculine. Hmmm. I would have to say neither of them really smell like coconut to me. I don't think I'd have noticed it in SL&C if it wasn't in the notes, even then, it's a whisper….just lends a tiny bit of creamy sweetness. I found the longevity very good for a JM, and I was dabbing, not spraying. But, it's softer than LBM. I got a sample of this at the Chicocoa Scentsation. I must say I was pleasantly suprised; I absolutely loathe the harshness of LBM (like Comet cleanser) and French Lime Blossom is too cloying for me – this is a subtle, sophisticated twist on lime and woods. I agree that it's not in the same league as Kohdo, more like its softer, simpler cousin. Ditto your feeling re VG, except I get an odd spice (like viburnum without the great smell). I loved it at first spritz, then I developed a raging allergy to it. Now I sneeze, violently, whenever it's sprayed anywhere near me, and develop some choking and burning in my throat. Lovely. It could be cedar-y on you. I have a very peculiar body chemistry. I turn sterling silver black in a day. The Lime Basil Mandarin is not shrill on me, but I never get the mandarin part. Grapefruit turns to white flowers in half an hour. The longevity of Sweet Cedar for me was fabulous. It lasted 5 hours and only faded because I got into the pool. But there was a bit on my T-shirt that I could snuffle for the whole evening. I should have ordered a 30 ml, but fell for the bigger one. I can see your problem, you don't want to read reviews that don't pertain to you, and that's understandable. I think I have a philosophical aversion to assigning a gender to each review though. I'll certainly give it some thought. LOL at Comet cleanser! Yep, same to me. Wish I'd just go and develop an allergy to VG so I could throw it out and be done with it. It sticks its tongue out at me every time I open the cabinet door. Well, I'm going to join you two in wishing I hadn't bought the full bottle of Vintage Gardenia. I still think it's pretty, but it IS just too sweet. It was my only blind buy ever, and that will teach me, huh? I love the Kohdo Wood ones, too – I'm especially wild about Day. I did! I like it combined with other scents but it's a little linear for me on it's own. Nice scent, but I found it needed some darkness/depth. Yes, same here – perhaps that's the other meaning of “Vintage” – “aged and forgotten at the back of a drawer”. That's funny, H, I kept wondering if you were going to be offended by some of us laying into VG with such abandon, only to find that it is an albatross for you too! Well remembered about me and The pour un Ete – indeed, my bottle of L'Ete en Douce is shaping up to be another albatross, and I am wishing I had bought that instead! So on that basis I am even more confident about liking the new lime one from JM and can't wait to hit town! This sounds intriguing! A little late for a summery scent, but still intriguing. Robin, I thought of you at the duty free airport in Iceland a couple of weeks ago—I did a relook and resniff of Chanel No 19 edt and fell in love. As it is green AND irisy, I thought sure it would be one of your loves, but I researched it here and found you're tepid about it. You're weird ;D.
I'm not sure if the perfume is meant to evoke the spiciness of Thai food per se, but I'm hoping that it would smell like a South-East Asian herb garden – a tangier, tart 'greenness'. Maybe that's why I adore Lime Basil and Mandarin. As a native of the region, I'm especially fond of tamarind and pandan, and have often wondered how our fruits and herbs would translate into perfume. Yes, it isn't dark — it really ought to be a spring release, IMHO. Hey L, so nice to see you! I am weird, I guess. But perhaps I need to try it again! And loved your pictures of Iceland, by the way. I would say it hits the tangy & tart pretty well, and it does have a definite SE Asia “vibe” — just isn't foody. I probably like it better this way than I would if it was foody. I have improvised a Weapon of Mass Destruction with which to attack VG today, in the shape of Heeley Verveine. Will keep you posted. So far, I'd say the VG is well on its way to “quivering whippetness” if I may borrow LT's expression for anaemic male frags, but it may still rally. Oh my, I should have thought the VG would slay Verveine with one hand behind its back. Do update. You'll be amazed, but it is the other way around at the moment – in fact I am seriously considering re-applying the VG in a bid to even up the firepower here. Over on the other hand, the same experiment is occurring with JM Nectarine Blossom and Verveine, and the fight seems pretty well matched just now. I doubt whether JM Verbenas de Provence could hack it, however, but this Heeley number truly is the Attila the Hun of lemon frags. The only thing that could pack more astringent lemon power would be floor cleaner. Thanks for the review! Now looking very much forward to smelling this when it arrives in Australia. Wow. I need some Verveine. It's got that much fire power? I'll add that to my Luckyscent sample list! That sounds great! Tell me, how well does it last? I don't know how well it would last on its own, but when engaged in mortal combat with tenaciously sucrose florals it seemed to hang on in there for a good few hours. Tried layering the VG with White Jasmine & Mint, and you might not think it, but WJ&M takes no prisoners, indeed I could barely smell the gardenia. Nice blend. I have now smelled the Sweet Lime and Cedar and it is exactly like those Walkers Thai lime and spices crisps I mentioned. That's a great taste all right, but not sure if I want to smell OF it! Unfortunately, yes. Everything takes ages to get down under, grumblegrumble. P.S. Sorry for the late reply! Missed your comment. Gosh — still not there??? A newspaper review I came across described the fragrance as “lime peel oil wrapped around a core of cedarwood”, which perfectly agrees with the majority of reactions by our customers upon sniffing it for the first time – they either smell one or the other. While the review agrees with you that Sweet Lime & Cedar is nicely done, it has unfortunately polarised our customers: either the lime or the cedar is too “much” for them and at any rate they conclude that it is “too masculine” a fragrance for them to wear. Oh well. Better an interesting fragrance than a forgettable one, eh? Yes! Polarizing fragrances are often the ones that matter.